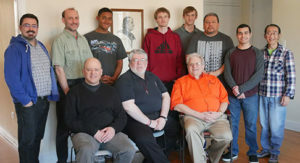 “Sometimes the most difficult person to forgive is ourselves,” was one of the many thoughts that were shared and reflected upon during this year’s Lenten Discernment Weekend, March 16-18 at Drexel Square Formation House in Chicago. Sr. Donna Liette, C.PP.S., Br. Juan Acuña, C.PP.S., and Fr. Dennis Chriszt, C.PP.S., shared and led our discussions throughout the day Saturday focused upon The Mercy of God, Forgiving Others, and Forgiving Ourselves. Through the sharing of stories, videos, and discussion, we engaged our inquires in Precious Blood Spirituality and community life. Each inquirer was invited to reflect upon his own person life and understanding of forgiveness and mercy. On retreat with us were inquirers: Travis Burns from Chickasaw, OH; Michael Orengo and Matt Carner from Dayton, OH; and Elliot Rich and Tony Sorgi from Chicago, IL. We were joined by members, Fr. Steve Dos Santos, Fr. Lac Pham, and candidate, Matt Perez. We ended our wonderful weekend with Mass at St. Ambrose and brunch at Mellow Yellow. May we continue to pray for vocations to religious life as well as the next steps for these men as these discern God’s calling in each of their lives.